Everything seemed to be 'going right' for Peter Parker/Spider-Man (Tobey Maguire): popularity in the city, top of his university class, and almost engaged to Mary Jane Watson (Kirsten Dunst) - a performing singing star on Broadway in Manhattan Memories; but he was treated antagonistically by vengeful Harry Osborn (James Franco) who carried on with his father's experiments; dressed in his father's Green Goblin attire and on a glider, he attacked Peter one evening, still wrongly claiming that Spider-Man had killed his father, until he suffered a head concussion - the injury produced short-term memory loss that caused him to forgot his vendetta. Meanwhile, "bad luck" escaped convict Flint Marko (Thomas Haden Church), "tied to the Ben Parker homicide", was "on the run" from Rikers and pursued by police in the marshlands into a particle accelerator, where during a freak accident, he was transformed by fusion into the Sandman. Things started to unwind when Mary Jane received bad critical reviews (and was soon to be replaced) and Peter's rescue of pretty blonde lab partner Gwen Stacy (Bryce Dallas Howard) from a building disaster brought him face-to-face with competing rival and Daily Bugle photographer Eddie Brock (Topher Grace). Spider-Man received the "key to the city" for his rescue of Gwen, NYPD Police Captain Stacy's (James Cromwell) daughter, but the ceremony caused a rift between Spider-Man and Mary Jane when Gwen kissed Spider-Man upside down. They were interrupted by Flint Marko's/Sandman's theft of an armored van causing Spider-Man to swing into action and afterwards ask: "Where do all these guys come from?" Peter's plan to propose to Mary Jane over dinner in a fancy French restaurant, using Aunt May's engagement ring, wasn't fated to happen, and soon after, Peter and Aunt May learned from Capt. Stacy that Flint Marko was Uncle Ben's killer (suspected carjacker Dennis Carradine was only an accomplice) - implying that Peter/Spider-Man had killed the wrong man (in the first film). Peter's vengefulness increased when a spidery-black symbiote (from an alien meteorite) bonded with Spider-Man's costume during sleep, making it black and imbuing his personality with a more brash, dangerous and aggressive nature (by amplifying "characteristics of its host, especially aggression"). His character changed when he confronted both Eddie Brock and then Marko after a bank robbery in an underground subway station - he left believing the Sandman was dead after he disintegrated in a flood of water. Forced to work in a Jazz Room nightclub as a singing waitress, lonely Mary Jane sought solace with Harry Osborn as a new love interest and soon afterwards was forced to break up with Peter (she told him: "I don't wanna see you anymore...I'm lonely. You aren't there for me...I've fallen in love with someone else") - Harry was demanding the breakup (and admitted he was "the other guy"), after losing his amnesia and reverting back to his angry self following another hallucinatory appearance of his father (Willem Dafoe) who ordered: "Avenge me...Make him suffer. Make him wish he were dead. First, we attack his heart." Jealousy caused Peter to don the black costume under his clothes and confront Harry in his mansion for a brutal fistfight, leaving Harry bloodied (and with a disfigured face). Peter also discredited Eddie Brock's front-page photo of the black-costumed Spider-Man that was designed to incriminate him, by asserting it was one of his own archived (and plagiarized) photos, causing Brock to be fired by chief boss J.J. Jameson (J.K. Simmons). Peter then appropriated Brock's girlfriend Gwen and sensuously danced with her in front of Mary Jane during her work to embarrass her. When he accidentally struck M.J. while being evicted by bouncers in the jazz club, she asked in bewilderment: "What's wrong with you?...Who are you?" While a "humbled and humiliated" Eddie Brock prayed to God in a church: "I want you to kill Peter Parker," black-suited Spider-Man in an upper belltower was attempting to peel off the offending costume that was strongly bonded to his body. The vibrations of the pealing church bell caused the symbiote to weaken, unbind and fall off - coincidentally though onto Eddie Brock standing below - who was changed into a new sharp-fanged and toothed villain named Venom. The black-suited Venom located Flint Marko and they joined forces: "Look, I wanna kill the spider, you wanna kill the spider. Together, he doesn't stand a chance." Mary Jane was taken hostage by Venom and suspended inside a taxicab that was 80 stories above the ground, held by a giant symbiote web. A confrontational message was sent to Spider-Man: "Stop us if you can." Red-suited Spider-Man sought Harry's help ("She needs us"), but he declined - although after he learned from his butler Bernard the truth of his father's death ("he died by his own hand"), he reversed his mind and joined Spider-Man as a team ("You came") to save him from death (the newscaster had just warned: "It could be the end of Spider-Man") in a brutal fight against Venom and Sandman. In the climactic final battle, Harry sacrificially lost his life when Venom impaled him with his own glider. By using a circle of vibrating pipes to weaken the symbiote, Spider-Man was able to separate Eddie from its effects - however, Eddie and the symbiote were destroyed together with an exploding Goblin pumpkin bomb. Flint Marko then confessed and explained his motivations for killing Peter's Uncle Ben, in order to have Spider-Man understand the loss and forgive him: "I didn't want this but I had no choice...My daughter was dying. I needed money. I was scared...the only thing left to me now is my daughter." Marko reverted to being the Sandman after being forgiven, and flew away in a column of sand to his family. And as Harry died, the two also forgave each other - reestablishing themselves as 'best friends'. The film concluded with Harry's funeral, and the reacquaintance of Peter with Mary Jane in her Jazz Club after she sang: "I'm Thru With Love," by an extended embrace. With a production budget of $258 million, and box-office gross receipts of $336 million (domestic) and $891 million (worldwide). The super-hero film set the record for the biggest 3-day domestic opening weekend in box-office history, at $151.1 million. This would soon be surpassed by The Dark Knight (2008) with $158.4 million, and then by Harry Potter and the Deathly Hallows, Part 2 (2011) at $169.1 million. 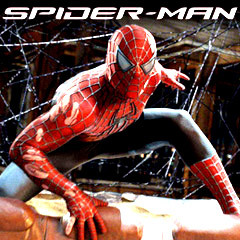 At the present time, it is the seventh highest-grossing (domestic) superhero film of all time, and the third highest-grossing (domestic) film in the franchise of Spider-Man films. Set-pieces: Harry's night-time glider attack on Peter Parker, the scene of an out-of-control crane (with steel girder) smashing into buildings and the rescue of Gwen Stacy, the Sandman's theft of an armored van, and their combat in an underground subway station, Peter and Harry's fistfight in the Osborn mansion, and the final climactic battle of Harry and Spider-Man against Venom/Brock and the Sandman.